For those of you who don't follow me on Instagram, I wanted to show you the fun photos that I have posted in the past few days. On Monday evening, my Grandma Biggs took me to jazz concert at the Park of Arts in Gresham, OR. 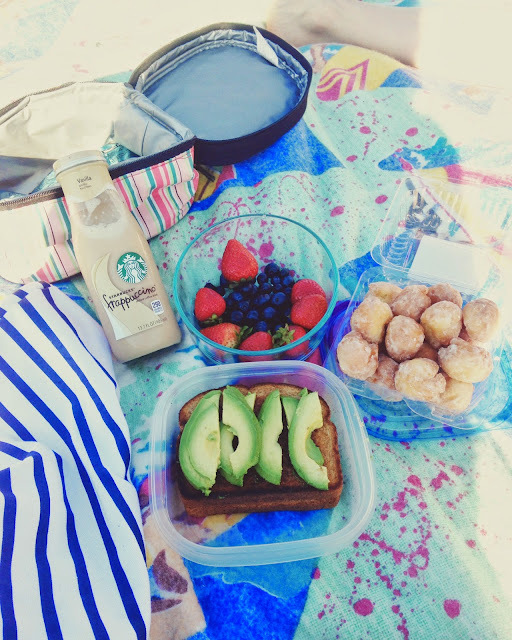 We always bring food to eat and a blanket to sit on while we listen to the music. This year, we met a neat girl and her and I just happened to have a lot in common. The food I brought was simply amazing. My favorite nibbles right now are blueberries, doughnuts, avocados, and coffee. I made a toasted cheese sandwich and put sliced avocados on the sandwich. Best. Thing. Ever. Yesterday morning, I decided to bring my breakfast to my pool deck and eat breakfast poolside. I made coffee in my French press (which decided to leak, so I exchanged it for a blue one at World Market shortly after breakfast), and I toasted an English muffin. I spread boysenberry jam on one half and I sliced an avocado and put the slices on the other half of the English muffin. I am a bit avocado obsessed right now. They are so good! I will keep eating them until I get sick of them. I made iced coffee with my French press, my ever so trusty mason jar is the cup I always use. I added almond milk to it, and caramel sauce. 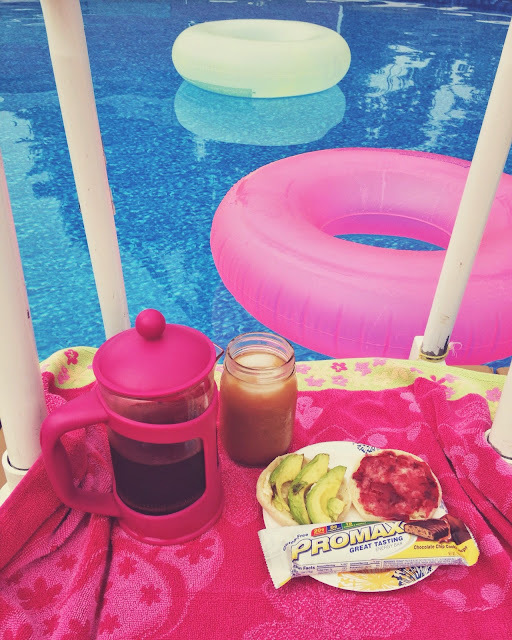 Lastly, I had a Promax protein bar for a sweet something, and to top my wonderful breakfast by poolside off. I went for a quick dip in the pool after waiting a considerable amount of time after I ate. Later yesterday evening, after I ate dinner, it was still blazing hot outside. 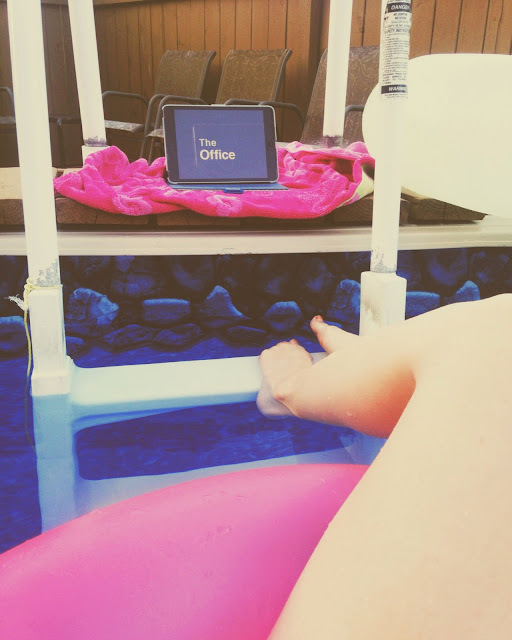 I took my iPad outside and set up (carefully) so I could watch The Office while I cooled off in the pool. It was relaxing, and super nice. I might do it again tonight after I nanny. So, so relaxing sitting on a floatie, and watching Netflix. I am a huge fan of Montagne Jeunesse facial masks. Right now, they are having a contest where you post a picture of ingredients from your own facial mask recipe, and what it does to benefit your skin for a chance to win a European City Break and for your mask to be the next new Montagne Jeunesse face mask. I could not pass this easy entry up! I make facial masks all the time! 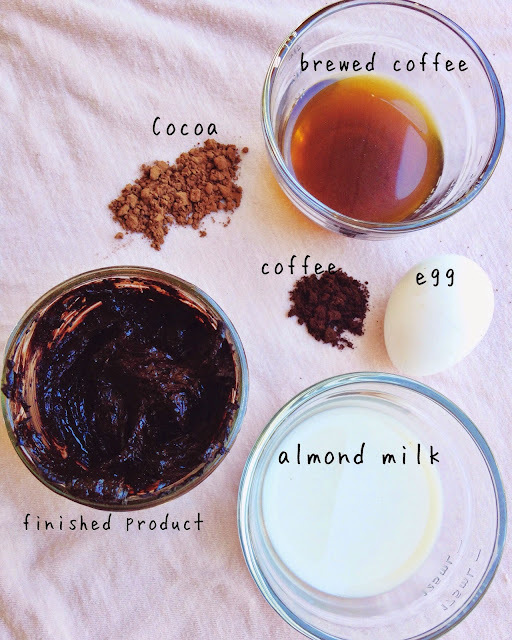 I call this the Cocoa Caffeine face mask. It exfoliates, and wakes your skin up! This mask is for those lazy mornings when your skin needs a zing. I like wearing this mask when it has been chilled in the fridge overnight. It feels amazing and smells heavenly. I have been making this mask for a few years now, and I love it! I posted this on Facebook, Twitter, and Instagram this morning for the contest entry. It's like having a delicious, chocolate mocha on your face. Food for your face. If you want to enter the contest, post your picture of face mask ingredients to Facebook, Twitter, and Instagram with the hashtag #MakeYourMask . It is so very close to heaven! ;) Thanks for reading.